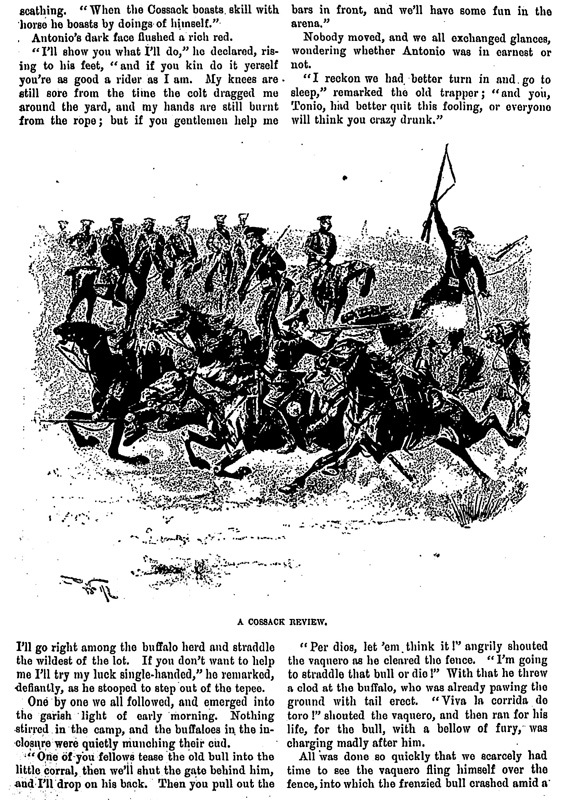 ATTACK ON A "PRAIRIE SCHOONER." IT was at the Wild West Show during the World's Fair. Together with a wandering artist I had strayed into the tepee of Peter Nelson, the old trapper. Here we found a motley company of cowboys, vaqueros, an Indian interpreter and a Cossack-hetman who had learned his English in Afghanistan. Attracted by the cheerful glow of the camp fire, two shivering Arabs entered the tent at our heels, and wrapping themselves up in their burnooses, began rolling cigarettes. Old Nelson, squatting on the floor like a red man, was telling a story of wild frontier life, which made the Cossack dreamily finger his sword hilt, while Nelson's half-breed son moved close to his father and seemed to drink in his words. "You fellers," said Nelson, "who only came into the show over on the other side, think that Cody ain't nothing but a smart rider with long hair, who can bow and scrape to the ladies in the boxes. That's whar you are mistaken. COLONEL WILLIAM F. CODY ("BUFFALO BILL"). "Let me tell you a story," he continued, "that none of these book writers have quite caught on to. 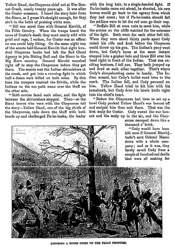 I mean Cody's great single-hand fight with Yellow Hand, the Cheyenne chief out at War Bonnet Creek, nearly twenty years ago. It was after the Custer massacre. I heard the story later from the Sioux, so I guess it's straight enough, for they ain't in the habit of praising white men. 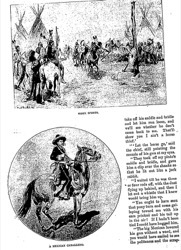 "Bill was scout then with General Merritt, of the Fifth Cavalry. When the troops heard the news of Custer's death they went nearly wild with grief and rage, I reckon, for Custer was an officer no one could help liking. 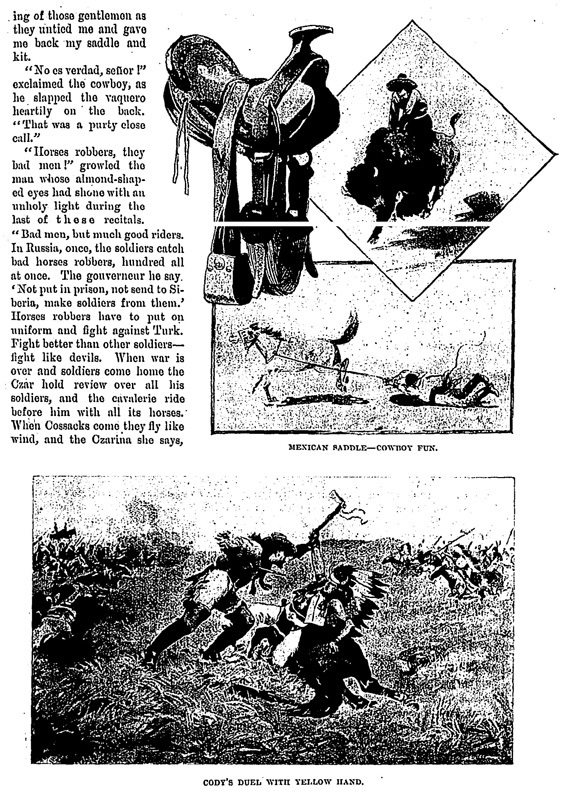 On the same night one of the scouts told General Merritt that eight hundred Cheyenne bucks had left the Red Cloud Agency to join Sitting Bull and the Sioux in the Big Horn country. General Merritt marched right off to stop the Cheyennes before they got there. The scouts met the Indian skirmishers at the creek, and got into a running fight in which half a dozen were killed on both sides. By this time the troopers reached the Divide, while the Indians on the war path came over the bluff on the other side. "Both armies faced each other, and the fight between the skirmishers stopped. Then—so the Sioux braves who were with the Cheyennes tell the story—Yellow Hand, one of the big chiefs of the Cheyennes, rode down the bluff with both hands up and challenged Pa-he-haska,  the leader with the long hair, to a single-handed fight. If Pa-he-haska came out ahead, he shouted, his own braves would go back to the agency from which they had come; but if Pa-he-haska should fall the soldiers were to let the red men go their way. "Buffalo Bill at once rode to meet him, while the armies on the cliffs watched for the outcome of the fight. Both went for each other full tilt. 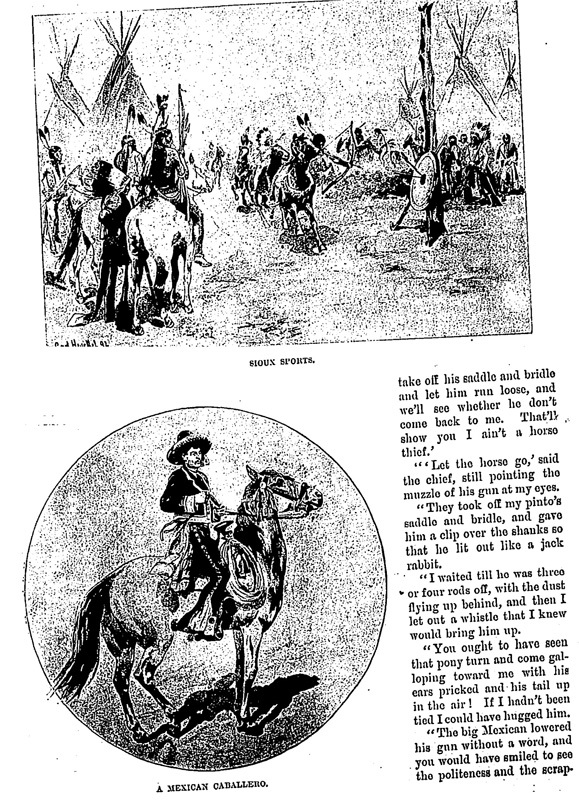 When they were about thirty yards apart Cody raised his rifle and fired before the Cheyenne could throw up his gun. 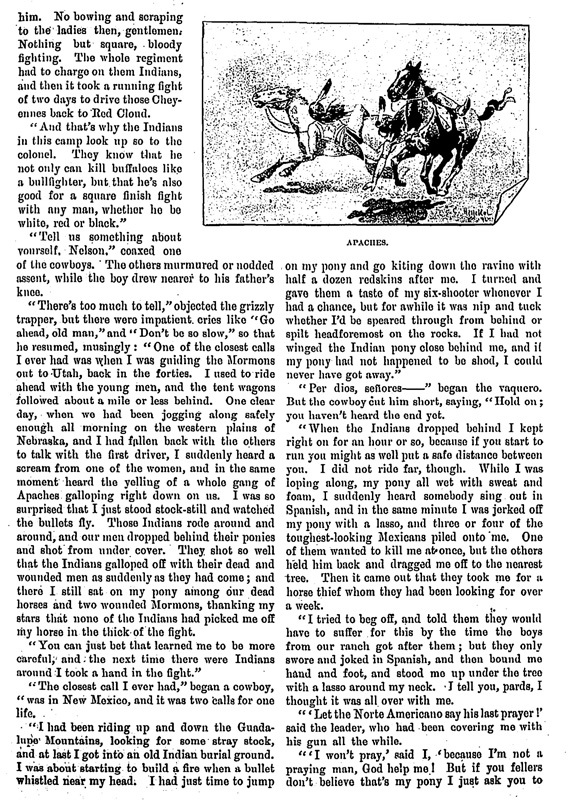 The Indian's pony went down, but Cody's horse at the same instant stepped into a gopher hole and threw Bill over his head right in front of the Indian. That was exciting business, I tell you. They both jumped up and fired at each other together. That's where Cody's sharpshooting came in handy. The Indian missed, but Cody's bullet went true to the mark. The Indian fell, and Cody pounced on him. Yellow Hand tried to hit him with his tomahawk, but Cody druv his bowie knife right into the chief's heart. "Before the Cheyennes had time to set up a howl Cody yanked Yellow Hand's war bonnet off and scalped him then and there. That was the first scalp for Custer. Cody waved the war bonnet and the scalp up in the air, and the Chey- [illustration] LYNCHING A HORSE THIEF ON THE TEXAN FRONTIER. ennes swooped down like a thousand o' brick. "Cody would have been kilt sure if General Merritt hadn't sent Colonel Mason down with a whole company; and as it was, they barely saved Cody from a couple of hundred red devils that were all making for him. No bowing and scraping to the ladies then, gentlemen. Nothing but square, bloody fighting. The whole regiment had to charge on them Indians, and then it took a running fight of two days to drive those Cheyennes back to Red Cloud. "And that's why the Indians in this camp look up so to the colonel. 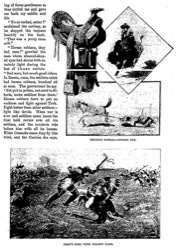 They know that he not only can kill buffaloes like a bullfighter, but that he's also good for a square finish fight with any man, whether he be white, red or black." "Tell us something about yourself, Nelson." coaxed one of the cowboys. The others murmured or nodded assent, while the boy drew nearer to his father's knee. "There's too much to tell," objected the grizzly trapper, but there were impatient cries like "Go ahead, old man," and "Don't be so slow," so that he resumed, musingly: "One of the closest calls I ever had was when I was guiding the Mormons out to Utah, back in the forties. I used to ride ahead with the young men, and the tent wagons followed about a mile or less behind. 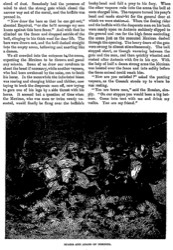 One clear day, when we had been jogging along safely enough all morning on the western plains of Nebraska, and I had fallen back with the others to talk with the first driver, I suddenly heard a scream from one of the women, and in the same moment heard the yelling of a whole gang of Apaches galloping right down on us. I was so surprised that I just stood stock-still and watched the bullets fly. Those Indians rode around and around, and our men dropped behind their ponies and shot from under cover. 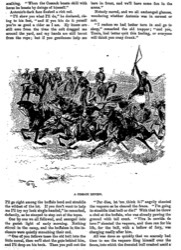 They shot so well that the Indians galloped off with their dead and wounded men as suddenly as they had come; and there I still sat on my pony among our dead horses and two wounded Mormons, thanking my stars that none of the Indians had picked me off my horse in the thick of the fight. "You can just bet that learned me to be more careful, and the next time there were Indians around I took a hand in the fight." "The closest call I ever had," began a cowboy, "was in New Mexico, and it was two calls for one life. "I had been riding up and down the Guadalupe Mountains, looking for some stray stock, and at last I got into an old Indian burial ground. I was about starting to build a fire when a bullet whistled near my head. I had just time to jump on my pony and go kiting down the ravine with half a dozen redskins after me. I turned and gave them a taste of my six-shooter whenever I had a chance, but for awhile it was nip and tuck whether I'd be speared through from behind or spilt headforemost on the rocks. If I had not winged the Indian pony close behind me, and if my pony had not happened to be shod, I could never have got away." 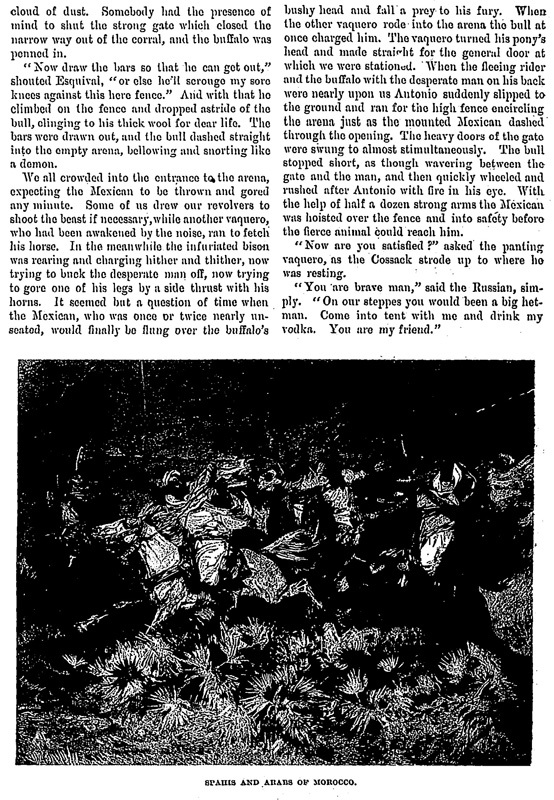 "Per dios, señores—" began the vaquero. But the cowboy cut him short, saying, "Hold on; you haven't heard the end yet. "When the Indians dropped behind I kept right on for an hour or so, because if you start to run you might as well put a safe distance between you. I did not ride far, though. While I was loping along, my pony all wet with sweat and foam, I suddenly heard somebody sing out in Spanish, and in the same minute I was jerked off my pony with a lasso, and three or four of the toughest-looking Mexicans piled onto me. One of them wanted to kill me at once, but the others held him back and dragged me off to the nearest tree. Then it came out that they took me for a horse thief whom they had been looking for over a week. "I tried to beg off, and told them they would have to suffer for this by the time the boys from our ranch got after them; but they only swore and joked in Spanish, and then bound me hand and foot, and stood me up under the tree with a lasso around my neck. I tell you, pards, I thought it was all over with me. "'Let the Norte Americano say his last prayer!' said the leader, who had been covering me with his gun all the while. "'Let the horse go,' said the chief, still pointing the muzzle of his gun at my eyes. "They took off my pinto's saddle and bridle, and gave him a clip over the shanks so that he lit out like a jack rabbit. "I waited till he was three or four rods off, with the dust flying up behind, and then I let out a whistle that I knew would bring him up. "You ought to have seen that pony turn and come galloping toward me with his ears pricked and his tail up in the air! If I hadn't been tied I could have hugged him. "The big Mexican lowered his gun without a word, and you would have smiled to see the politeness and the scraping of those gentleman as they untied me and gave me back my saddle and kit. "No es verdad, señor!" exclaimed the cowboy, as he slapped the vaquero heartily on the back. "That was a purty close call." "Horses robbers, they bad men!" growled the man whose almond-shaped eyes had shone with an unholy light during the last of these recitals. "When Cossacks hear that they feel such pleasure they stand on their heads on saddle and shoot off rifles in air." The Spahi officer,  who had been silently smoking one cigarette after the other, slowly leaned forward, and said in French: "The Faithful are still guarding Stamboul, praise be to Allah! and so long as an Arab horse is left in Araby, and a Mussulman in the land of the Prophet, no Cossack shall behold our minarets nor hear the muezin's call. 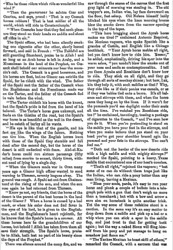 The Cossack is a good horseman, and his horses are fleet, but no Giaour can outride the Spahi, for he rideth with the wind. The father of the Spahi met the father of the Cossack when the Englishman and the Frenchman made war on the Tartar, and the father of the Cossack fled in vain before the wind. "The Tartar chideth his horse with the knout, but the Spahi's pride is fed from the hand of his beloved. The Tartar's horse goes unkempt, and feeds on the thistles of the road, but the Spahi's war horse is as beautiful as the well in the desert, and he eateth of barley all he wants. "His eye is like that of the gazelle, and his feet are like the wings of the falcon. Nothing can tire him. When the English horses hunt with those of the Spahi they stumble and fall dead after the second day, but the horse of the desert is still unflecked with foam. Abd-el-Kader's horse could run sixteen parasangs (fifty miles) from sunrise to sunset, thirty times, without need of lying by a single day. "When the Giaours made war in Oran many years ago a Giaour high officer wanted to send warning to Tlemsen, seventy leagues away. The ground was rough. A Spahi set out from Chateau-neuf at the rising of the sun, and when the sun rose again he had returned from Tlemsen. 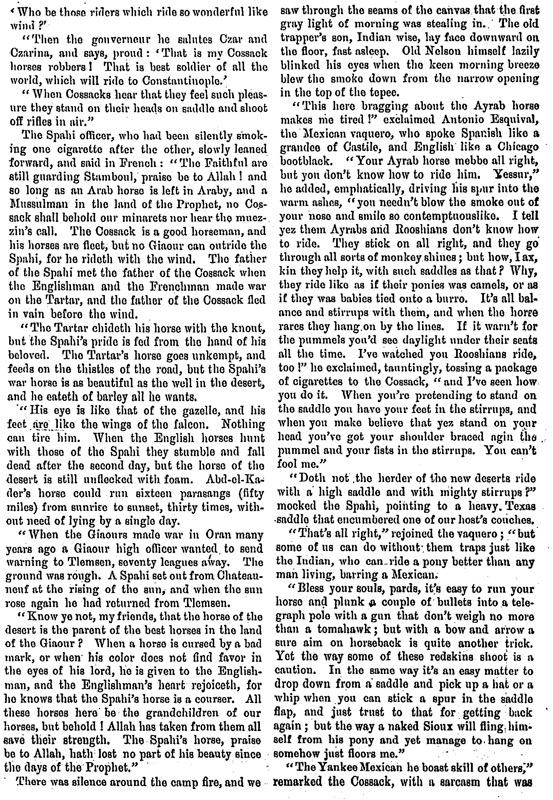 "Know ye not, my friends, that the horse of the desert is the parent of the best horses in the land of the Giaour? When a horse is cursed by a bad mark, of when his color does not find favor in the eyes of his lord, he is given to the Englishman, and the Englishman's heart rejoiceth, for he knows that the Spahi's horse is a courser. All these horses here be the grandchildren of our horses, but behold! Allah has taken from them all save their strength. The Spahi's horse, praise be to Allah, hath lost no part of his beauty since the days of the Prophet." There was silence around the camp fire, and we saw through the seams of the canvas that the first gray light of morning was stealing in. The old trapper's son, Indian wise, lay face downward on the floor, fast asleep. Old Nelson himself lazily blinked his eyes when the keen morning breeze blew the smoke down from the narrow opening in the top of the tepee. "This here bragging about the Ayrab horse makes me tired!" exclaimed Antonio Esquival, the Mexican vaquero, who spoke Spanish like a grandee of Castile, and English like a Chicago bootblack. "Your Ayrab horse mebbe all right, but you don't know how to ride him. Yessur," he added, emphatically, driving his spur into the warm ashes, "you needn't blow the smoke out of your nose and smile so contemptuouslike. I tell yez them Ayrabs and Rooshians don't know how to ride. They stick on all right, and they go through all sorts of monkey shines; but how, I ax, kin they help it, with such saddles as that? Why, they ride like as if their ponies was camels, or as if they was babies tied onto a burro. It's all balance and stirrups with them, and when the horse rares they hang on by the lines. If it warn't for the pummels you'd see daylight under their seats all the time. I've watched you Rooshians ride, too!" he exclaimed, tauntingly, tossing a package of cigarettes to the Cossack, "and I've seen how you do it. When you're pretending to stand on the saddle you have your feet in the stirrups, and when you make believe that yez stand on your head you've got your shoulder braced agin the pummel and your fists in the stirrups. You can't fool me." "Doth not the herder of the new deserts ride with a high saddle and with mighty stirrups?" mocked the Spahi, pointing to a heavy Texas saddle that encumbered one of our host's couches. 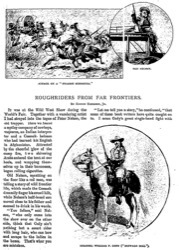 "That's all right," rejoined the vaquero; "but some of us can do without them traps just like the Indian, who can ride a pony better than any man living, barring a Mexican. "Bless your souls, pards, it's easy to run your horse and plunk a couple of bullets into a telegraph pole with a gun that don't weight no more than a tomahawk; but with a bow and arrow a sure aim on horseback is quite another trick. Yet the way some of these redskins shoot is a caution. 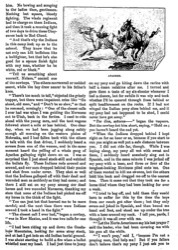 In the same way it's an easy matter to drop down from a saddle and pick up a hat or a whip when you can stick a spur in the saddle flap, and just trust to that for getting back again; but the way a naked Sioux will fling himself from his pony and yet manage to hang on somehow just floors me." "The Yankee Mexican he boast skill of others," remarked the Cossack, with a sarcasm that was scathing. "When the Cossack boasts skill with horse he boasts by doings of himself." Antonio's dark face flushed a rich red. "I'll show you what I'll do," he declared, rising to his feet, "and if you kin do it yerself you're as good a rider as I am. 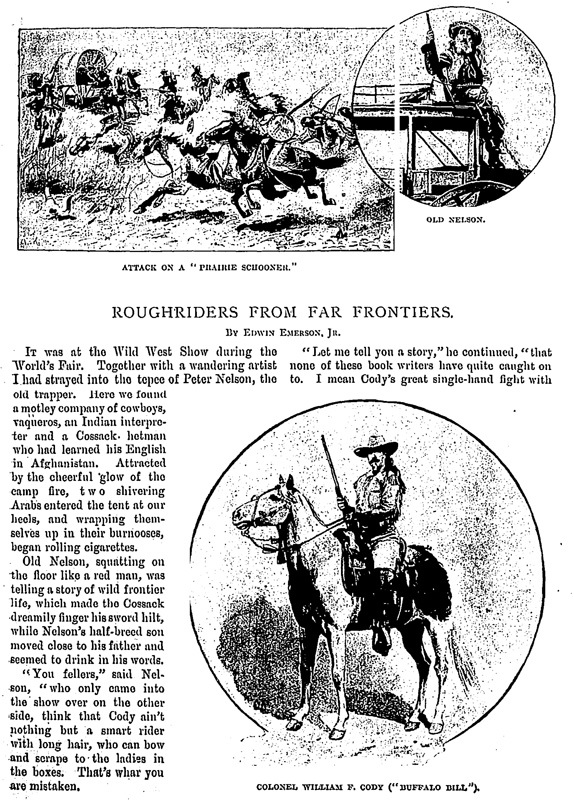 My knees are still sore from the time the colt dragged me around the yard, and my hands are still burnt from the rope; but if you gentlemen help me [illustration] A COSSACK REVIEW. I'll go right among the buffalo herd and straddle the wildest of the lot. If you don't want to help me I'll try my luck single-handed," he remarked, defiantly, as he stooped to step out of the tepee. One by one we all followed, and emerged into the garish light of early morning. Nothing stirred in the camp, and the buffaloes in the inclosure were quietly munching their cud. "One of you fellows tease the old bull into the little corral, then we'll shut the gate behind him, and I'll drop on his back. Then you pull out the bars in front, and we'll have some fun in the arena." Nobody moved, and we all exchanged glances, wondering whether Antonio was in earnest or not. "I reckon we had better turn in and go to sleep," remarked the old trapper; "and you, Tonio, had better quit this fooling, or everyone will think you crazy drunk." "Per dios, let 'em think it!" angrily shouted the vaquero as he cleared the fence. "I'm going to straddle that bull or die!" With that he threw a clod at the buffalo, who was already pawing the ground with tail erect. "Viva la corrida de toro!" shouted the vaquero, and then ran for his life, for the bull, with a bellow of fury, was charging madly after him. All was done so quickly that we scarcely had time to see the vaquero fling himself over the fence, into which the frenzied bull crashed amid a cloud of dust. Somebody had the presence of mind to shut the strong gate which closed the narrow way out of the corral, and the buffalo was penned in. "Now draw the bars so that he can get out," shouted Esquival, "or else he'll scrouge my sore knees against this here fence." And with that he climbed on the fence and dropped astride of the bull, clinging to his thick wool for dear life. The bars were drawn out, and the bull dashed straight into the empty arena, bellowing and snorting like a demon. We all crowded into the entrance to the arena, expecting the Mexican to be thrown and gored any minute. Some of us drew our revolvers to shoot the beast if necessary, while another vaquero, who had been awakened by the noise, ran to fetch his horse. In the meanwhile the infuriated bison was rearing and charging hither and thither, now trying to buck the desperate man off, now trying to gore one of his legs by a side thrust with his horns. It seemed but a question of time when the Mexican, who was once or twice nearly unseated, would finally be flung over the buffalo's bushy head and fall a prey to his fury. When the other vaquero rode into the arena the bull at once charged him. The vaquero turned his pony's head and made straight for the general door at which we were stationed. When the fleeing rider and the buffalo with the desperate man on his back were nearly upon us Antonio suddenly slipped to the ground and ran for the high fence encircling the arena just as the mounted Mexican dashed through the opening. The heavy doors of the gate were swung to almost stimultaneously. The bull stopped short, as though wavering between the gate and the man, and then quickly wheeled and rushed after Antonio with fire in his eye. With the help of half a dozen strong arms the Mexican was hoisted over the fence and into safety before the fierce animal could reach him. "Now are you satisfied?" asked the panting vaquero, as the Cossack strode up to where he was resting. "You are brave man," said the Russian, simply. "On our steppes you would been a big hetman. Come into tent with me and drink my vodka. You are my friend." SPAHIS AND ARABS OF MOROCCO.